What wavelengths can this beamline cover? Our FTIR microscope typically operates in the mid-IR region from 750 cm-1 up to 6000 cm-1. Please see Technical Information for more details. The long wavelenth range can also be extended to 550 cm-1 if required using the wide band detector but with a 10x loss in sensitivity, and a larger aperture size of 20x20 μm2 is required, compromising spatial resolution. We recommend that this detector only be used if you are interested in specific bands within the 900-550 cm-1 range. Using a 20x20 μm2 aperture. Using a 5x5 μm2 aperture. How do I demonstrate that I need the synchrotron for my experiments? When preparing your beamtime proposal, it is important that you demonstrate that there is a need for the high lateral spatial resolution achievable at the beamline – the beam can be focused to a 3-10 micron spot size and is ideal for rastor mapping complex heterogeneous samples. It is better to specifically state a size or size range that is required, in microns. Remember that as the wavelength of mid-IR radiation is in this 3-10 micron range, so this will be the approximate smallest sized objects that can be individually resolved using this beamline. 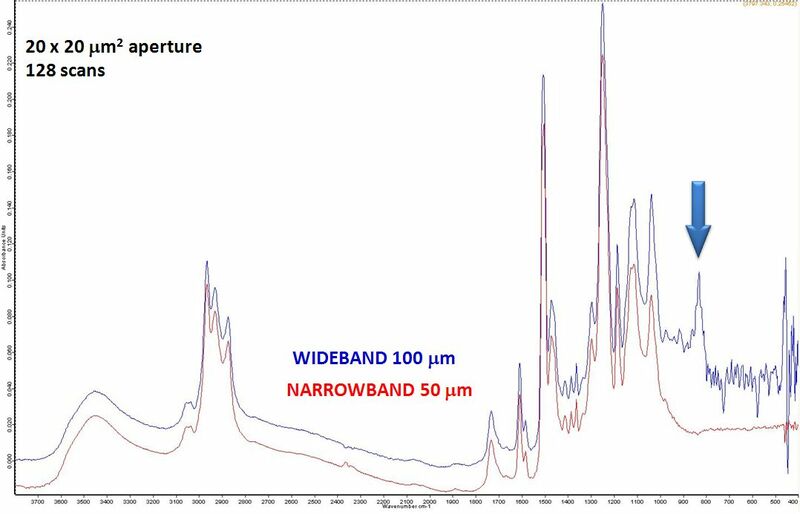 Experiments requiring a spot size of 50 microns or greater, or that require 'bulk' or average measurements per sample, will have no advantage using the synchrotron and can be carried out on a lab-based IR microscope. If you can show that desired results were unsuccessful using a lab-based IR microscopy, this can be advantageous for your application to use our beamline. More information on what to include in your proposal can be found on our 'Beamtime on this beamline' page. Please contact beamline staff if you are unsure whether your experiment would benefit from use of the synchrotron. How long will it take to measure an IR map of my sample? For a typical condensed phase sample e.g. 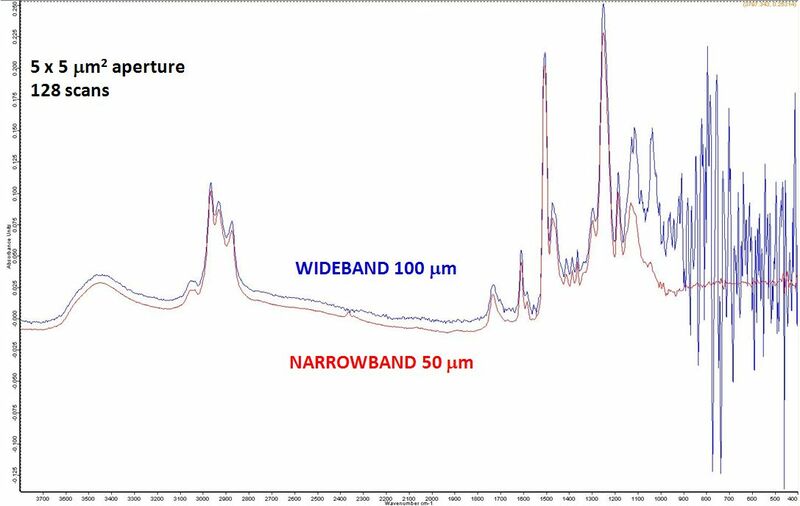 a tissue section on a calcium fluoride slide, and using a spatial resolution of around 5 microns with an aperture (beam size) of also 5 microns, you can usually obtain good spectra in approx. 10 seconds per point (assuming 32 averages per point). People tend to run maps of about 400-600 points, so maps of about 1-2 hours. Please note our system (OPUS 6.5) can measure maps of up to 4000 points depending on your spectral resolution. If your sample is weakly absorbing, it will take longer to complete any maps as you will need to increase the number of averages per point. This can be assessed at the beginning of your beamtime. I would like to use the XFM and IR beamlines to examine the same samples. Can this be done? Yes, however if exactly the same sample is to be measured on both beamlines, it will have to be deposited onto ideally a 100 nm thick silicon nitride window (see here for more information). Please state in your proposal if you have applied for both the XFM and IR beamlines as, if beamtime is granted for both applications, we can work to make sure your beamtimes are adjacent. What exactly is the difference between the THz/Far IR beamline and the IR Microscopy beamline? The IR Microscopy beamline operates in the mid-IR region (typically 750-3800 cm-1) and is ideal for studying condensed-phase, heterogeneous samples due to the high spatial (by which we mean high lateral spatial) resolution that can be achieved. The measurement area can be decreased to diffraction-limited spot sizes of between 3-5 microns, and the Bruker microscope stage can step across a sample in precise steps of down to 1 micron. This beamline is thus ideal for creating chemical maps of a sample by rastor mapping along complex samples over regions of interest. Please speak to beamline scientist if you would like to conduct experiments across both beamlines. Each beamline requires its own, separate, proposal application for beamtime. Can I measure the depth profile of my sample? This beamline cannot do depth profiling (axial mapping of a sample), however when operating in transmission mode the z-height of the microscope stage can be moved through the focus of your sample in a set step size, so if your sample is thicker than 5 microns, e.g. you are working with a 30 micron polished wafer of rock with an inclusion in the middle, you can focus the beam into your inclusion. The lateral spatial resolution achievable does degrade from the diffraction limit however when you have thicker samples. The ATR on our beamline is also of a fixed angle, so again cannot be used to profile depth. You recommend use of transmission over transflection IR spectroscopy where possible. Why is that? IR analysis can be run using transflection, which requires sections to be laid onto IR reflective slides e.g. Kevley MirrIR slides, instead of straight transmission. MirrIR slides are much cheaper than IR transmissive slides such as calcium fluoride and have the larger dimensions of normal microscope slides (1 x 3 inches), so you can potentially lay 1-3 sections per slide. There are inherent problems with this method however, in that your sample e.g. if working with tissue sections, have to be extremely uniform and ideally 4 microns thick, rather than the 5-8 microns thick required for transmission with a bit more leeway in the uniformity. Results are also more difficult to interpret using this method. We recommend the following papers discussing the potential issues with transflection analysis for further information. K. Malek, B.R. Wood, K.R. Bambery. FTIR Imaging of Tissues: Techniques and Methods of Analysis; Chapter 15. in book M. Baranska (ed. ), Optical spectroscopy and computational methods in biology and medicine. Springer Science, 2014. Do I need to microtome my samples for analysis? The synchrotron has a microtome onsite that you can access if requested as part of your beamtime. The microtome is used for samples that are in the form of a solid plastic-like material, or that can be embedded in an IR transmissive material like AgCl e.g. using a pellet press (the synchrotron also has a pellet press onsite), to transverse slice them into pieces ideally 5 microns in thickness (perhaps thinner if they are strongly absorbing) for analysis in transmission. In addition, if you have samples for use with the ATR, the microtome may be used to expose a smooth surface for analysis. Site access can be granted earlier than your scheduled beamtime to prepare microtomed samples if arranged with beamline staff prior to your beamtime. If you require microtomed tissue and/or cryosections, or your samples are tricky and you require expert help, we recommend contacting the Victorian-based company Hawthorn Histology for advice. Can the beamline be used to examine soil samples? Yes, the beamline has been used by several groups to examine soil particulates. If you require the spectra to be collected from individual microscopic sized grains or small particles of soil, this would be your primary argument in any proposal for your need to use synchrotron radiation. Remember however, that as the wavelength of mid-IR radiation is in the range 3-10 microns that this will be the approximate smallest sized objects that can be individually resolved. Typical methods of sample preparation include using transmission mode by sandwiching the soil samples between diamond windows using our diamond window micro-compression cells (see Techniques Available for more information). Many organic molecules are relatively strong absorbers of IR radiation so by flattening them between the windows, successful spectra of soil particulates can be collected. Water is however also a strong absorber and so you may need to consider whether you can dehydrate the soils without significantly disrupting the native chemistry. Some absorbed water can be worked with but it will mask spectral signatures coming from other O-H groups, C=O carboxylates etc., and to a lesser extent the C-O from carbohydrates etc. Soil samples can also be embedded in an IR transmissive material like KBr. Previous groups have first gently pressed a thin KBr pellet (50 mg KBr, pressed at 7 tonnes for 2.5 minutes), then have sprinkled some particles selected with a fine needle on the top of the pellet before pressing again (7 tonnes for 2.5 minutes), to create thin pellets for transmission. A pellet press is available onsite for this purpose if required. An advantage of this method over use of the diamond window micro-compression cell is that the refractive index of KBr is close to that of soil, limiting any scattering effects around the edges of the particles. Disadvantages include a higher wavenumber cut-off closer to 900 cm-1, when compared to that achieved when using the compression cell with a cut-off closer to 750 cm-1. Where do you buy your IR transmissive windows? The company we typically purchase our IR transmissive windows from is Crystran, a company based in the UK. We normally recommend using their calcium fluoride windows, 0.5 mm thickness by 13 mm or 22 mm diameter. These are stock items so are typically delivered very quickly (we've had them within a week if the order is urgent). Zinc selenide and barium fluoride are also popular materials (0.5 mm thickness again), depending on the wavelength region of analysis. Some windows can be washed and reused (see below), however they do have a finite lifetime. Which IR transmissive windows should I use for my experiment? Lower limit at beamline 1000 cm-1 Our most commonly used window material. Particularly good for cell culturing purposes or when working with wet samples, e.g. cyrosectioning, etc. Windows can be carefully washed and reused. Lower limit at beamline 900 cm-1 Lower wavenumber limit than CaF2 windows but the windows craze/go cloudy quickly when in the presence of water. Particularly good when working with wet samples or when analysis requires a lower wavenumber limit. Can be used in cell culturing, however this appears dependent on the cell line. Some lines easily adhere to the surface while others appear to show toxicity from the window material. It can help to first coat the windows in protein (soak in culture media) before cell culturing. Windows can be carefully washed and reused. Can I wash and reuse my IR transmissive windows? Yes, if the windows are not made of barium fluoride. Windows have a finite lifetime but can be washed a reused a limited number of times before becoming excessively scratched. Use water and/or a mild detergent to wash them, and lens tissue to gently polish them. How do I download my original data when offsite from the synchrotron? Then go to ‘Storage Gateway’ and under ‘Select Experiment’, choose the experiment EPN you wish to download. Under ‘Select Transfer Method’, choose ‘SSL Transfer’, and then click the ‘Select’ button. In the next window, choose the folders/files that you wish to download and click the appropriate Download button. Data will be downloaded as a zipped file to your computer. I wanted to download my data remotely from the synchrotron but I cannot see my EPN/project in the ‘Select Experiment’ window. To see data from a particular project, the Principle Scientist listed on the original Experiment Authorisation form must give you access via their VBL login. They can do this by going to ‘Experiment User Access Management’ under their VBL login, choosing the EPN and then adding the names of anyone they wish to have access to the original data by typing in their email address and double clicking on the name. Note that people must be registered users of the Australian Synchrotron for their emails to be present in the system.